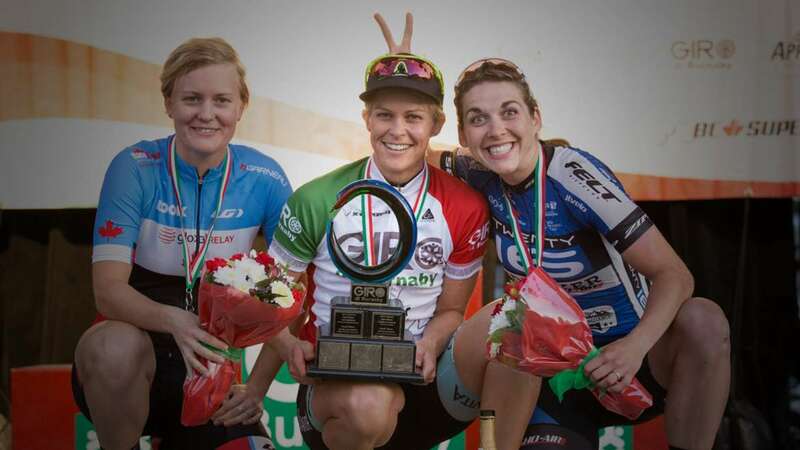 Burnaby, BC – After a second place finish at the Global Relay Gastown Grand Prix the night before, Kimberley Wells (Colavita | Bianchi) was able to just get ahead of two Canadian National Team members to win the Giro di Burnaby p/b Appia Development on Thursday. It looked like the women would ride in the rain at the beginning of the race, but a quick storm passed just as they took the start line and the roads were dry by the time Wells crossed the finish with a time of one hour, 39.22 seconds. Wells and the rest of the field had to strategize if the rain did stick around for the start of the race and they all had to adjust on the fly when it stopped. The performance of the Colavita team during the 30 lap, 39 kilometre race was a textbook showcase in how cycling truly is a team sport. “This is my first time racing BC Superweek and Canada’s attracted a lot of Aussies up here. It’s really unfortunate that 99 Aussie cents only makes one Canadian dollar so Canada’s got something up on us, but I’ll happily take some Canadian dollars home at this stage!” Wells laughed. Despite the fact that Stephanie Roorda’s specialty and favourite event is track cycling, the Canadian Women’s Team Pursuit Record holder is doing quite well in the criterium races at BC Superweek this year, including a second place finish behind Wells in Burnaby. A Vancouver native, the second placing is Roorda’s third appearance on the podium in four races. Wearing the Canadian National Team jersey, the 29-year-old was third in Saturday’s Brenco Criterium and second in Friday’s MK Delta Lands Criterium as part of the Tour de Delta. Fellow Canadian National Team rider and 2015 Canadian National Criterium Champion Alison Jackson posted her second third place finish of BC Superweek. The former triathlete from Vermillion, Alberta, was also third in Sunday’s White Spot | Delta Road Race. BC Superweek continues Friday night with the inaugural PoCo Grand Prix p/b Dominion Lending Centres. The youth race starts at 4:45 pm, the pro women at 6 pm, and the pro men at 7:20 pm.